Horses affected by Equine Insulin resistance (IR) and Equine Cushing’s Disease (ECD) require modification in several areas of their management to regain a healthful status. Management of each disorder is essentially the same and diligent adherence to dietary, exercise and therapeutic changes are mandatory to avoid long term, negative and debilitating health effects. We now know that horses with IR and ECD do not metabolize starch and sugar like normal horses and this negatively affects endocrine function, but other major health problems are also associated with the disorders. For example, obesity is one of the most serious clinical manifestations of IR and ECD, though not all horses affected by these disorders become grossly overweight. Excessive fat deposits adversely predispose horses to exercise related disorders, increased risk of laminitis, colic and hyperlipidemia (abnormally high blood lipid concentrations), growth and reproductive problems. Obesity in horses is associated with an increased risk of laminitis or founder which results in separation of the laminae and downward rotation of the coffin bone in the hoof. This is a common problem in overweight broodmares and stallions. Excess weight carried by obese horses dramatically increases the risk of rotation of the pedal bone following a bout of laminitis. This damage is irreversible and difficult to manage, plus these horses are more inclined to suffer subsequent episodes of laminitis in the future. Obesity in broodmares can lead to laminitis and insulin resistant mares can have difficulty becoming and staying pregnant, and also have difficulty delivering a foal. Fetal growth can also be negatively impacted by obesity in the mare. Over conditioned mares have an increased chance of producing a foal exhibiting developmental orthopedic diseases after birth. Other areas of concern for IR or ECD affected horses is lowered immune response. Horses with ECD often become immunosuppressed and susceptible to a variety of parasitic or infectious agents. Many cases show muscle loss and become polydipsic (increased water intake) and polyphagic (excessive feed intake), which can lead to obesity. The longevity and productivity of the over-conditioned or obese horse is much less than that of a normal horse, especially in horses affected by IR or CS. Management techniques must be altered to encourage weight reduction by increasing exercise, making necessary dietary modifications and administering therapeutics to correct the problems. Managing the horse with a metabolic disorder may involve a combination of medication to normalize the function of the pituitary gland and dietary and exercise modification. Most of these changes will be for life as in many cases, there is no way to reverse the disease process. This is particularly true for horses with ECD. Medications used to treat ECD focus on reducing the amount of ACTH secreted by the pituitary and/or suppression of cortisol synthesis by the adrenal glands. The drug of choice is currently pergolide mesylate (Permax®), which is administered daily by the oral route. Other management techniques that work for horses with metabolic disorders include increasing exercise, body clipping to remove the long hair coat, strict attention to teeth, hooves and because affected horses are often insulin resistant, utilizing concentrates lower in starch and higher in soluble fiber and fat. Horses suffering from any type of metabolic disorder must be managed very closely to ensure the intake of sugars and starch are minimized if not completely eliminated from the diet. The use of high fat and fiber rations to offset the effects of blood glucose response to concentrate meals high in starch is largely becoming the standard choice of ration fed to these horses. By supplying the horse with energy or calories in the form of fat or soluble fiber, insulin resistance is curtailed because blood glucose levels remain low following a meal. These horses should also be maintained on grass forages or forages low in soluble sugars called fructans, as these will also cause a rise in blood glucose if consumed in large quantities. Spring and fall pasture is an excellent source of fructans and therefore horses with metabolic disorders should have limited access to pasture during these periods. Other specific nutrients that are useful in managing the above-mentioned disorders are chromium and magnesium, as these nutrients play a role in reducing resistance to insulin. Horses affected by ECD and IR may be magnesium and chromium deficient though no specific requirement has been defined for horses. Chromium is an element which combines with niacin to form Glucose Tolerance Factor (GTF). Though the exact mechanism remains unidentified, it appears GTF helps increase insulin sensitivity by increasing the number of receptor sites for insulin to bind to the cell, enabling more glucose to gain entry into the cell for storage. Intracellular magnesium is a cofactor for numerous enzymes involved in carbohydrate metabolism and horses that are IR are deficient in magnesium. The lower intracellular magnesium concentration may result in reduced insulin sensitivity, either by altering receptor activity after insulin binds to a cell or by influencing intracellular signaling and processing. Increasing the dietary level of magnesium and chromium in the diets of horses affected by these disorders may be effective in alleviating some or all of the symptoms. However, the addition of these nutrients should be achieved by using a balanced supplement or the advice of a professional, as excesses of any of these nutrients can cause serious nutritional imbalances and further complications. Side Bar – Is your horse obese? Body condition scoring is a system in which several areas of the horses’ body are evaluated and then the horses’ condition is scored on a scale of 1 to 9. The lowest scores are for thin or emaciated horses, the highest for fat or obese horses. It is important to assess more than one area since individuals may distribute their fat deposits differently. If your horse has more than 1 or 2 of the signs listed below when you feel/look at the various parts of its body, it is probably is overweight. Horses should be maintained at condition scores of 5-7 for optimum health and performance. The optimum body score for working horses, stallions, barren mares and growing horses is 5-6, and for lactating broodmares is 6-7. Reproductive efficiency is better when broodmares are maintained at scores of 6-7 because broodmares with foals by their side need some fat stores due to the high nutritional requirements of lactation. Body scores of 8-9 predispose horses to colic, laminitis, and founder. Overly fat horses also have poorer reproductive performance and decreased work performance. Ribs are difficult to feel even with firm pressure. Neck is “cresty” and bulging. Withers are rounded with only the very top of the spinous processes palpable or covered with fat. Girth has fat build-up around the lower area such that the girth makes an indentation when tightened. Loin has a distinct crease (indentation) in the area behind the saddle position and in front of the croup. Tailhead area at both sides of the root of the tail is bulging and feels very soft. Inner thighs rub together more than ¼ of the way down when the horse is standing square. Side Bar – Feeds acceptable for feeding to horses with ECD, EMC, and IR Grass forages, grass/legume mixed forages, low quality pasture, variety of natural forages Concentrates containing a small amount of oats, beet pulp, rice bran, soybean hulls, flax seeds, vegetable fats. 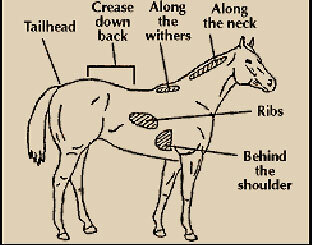 Concentrates should have little to no starch content unless the horse is engaged in heavy work. Starch levels in concentrates for these horses should be in the 10-15% range but no higher. Avoid sweet feeds completely. Processed feeds are better than feeds with raw grains. Do not allow affected horses access to lush pasture, use grazing muzzle if needed.